Clinton, Michigan - Eden Foods was selected as the best food company in the world and the third best company overall by The Better World Shopping Guide. They acknowledged Eden's outstanding record in social and environmental responsibility. The company earned A+ and A ratings in ten food categories. The Better World Shopping Guide provides information needed to make informed purchasing decisions. Author Ellis Jones, Ph.D. writes, "As consumers we vote every single day… Every dollar you spend is a vote for the world you want to live in." The book is based on 20 years of data on corporate behavior in the areas of human rights, the environment, animal protection, community involvement, and social justice. Eden received an A+ grade in the following categories: • Milk & Alternatives, • Oil & Vinegar, • Rice & Other Grains, • Soups, Noodles & Curries, and • Sugar, Spices, & Sweeteners. Eden Foods was the only company awarded an A+ in the categories of • Canned Beans & Chili, • Canned Fruit & Vegetables, • Condiments, and • Pasta & Sauce. An A rating was awarded in the Baked Goods & Baking Supplies category. "One of our founding principles is sustainability. It guides us today," said Sue Becker, Marketing Director. "Eden values its precious relations with USA family farms. We are committed to sustainability as our work reflects. It's an honor to be recognized for our care of the planet and people's food." 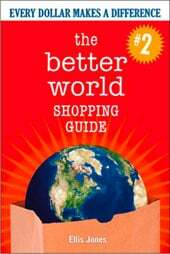 The Better World Shopping Guide can be found at www.betterworldshopper.org. Eden Foods is a 41 year principled manufacturer of natural food that's authentic, organic, traditional, , Pure, and superb pantry fare. More information and over 880 free recipes are at www.edenfoods.com. To receive Eden press releases by email, please call 800 248-0320 or email press@edenfoods.com. Retailers, institutions, and co-ops, please visit access.edenfoods.com.